Cadmium selenide CdSe is most suitable crystal material for polarizers, IR optics, sources for vaccum deposition, beamsplitters, DFM converters. W. Chen, F. Cazier, F. Tittel, D. Boucher, Appl. Opt. 39 (2000) 6238. G.C. Bhar, S. Das, K.L. Vodopyanov, Appl. Phys. B 61 (1995) 187. W. Chen, G. Mouret, D. Boucher, Appl. Phys. B 67 (1998) 375. G.C. Bhar, D.C. Hanna, B.Luther-Davies and R.C.Smith, Optics Communications, Vol 6, number 4 (1972) 323-326. D.C. Hanna, B.Luther-Davies, R.C.Smith and R.Wyatt, Appl Phys Letters, Vol. 25, No. 3 (1974) 142-144. A.Dhirani, P.Guyot-Sionnest, Opt. Lett. 19 (1995) 1104. K.L. Vodopyanov, Opt. Commun. 150 (1998) 210. T.. Alik, S.Chandra, D.M.Rines, et. al., Opt. Lett 22 (1997) 597. Coherent sources in the mid-IR domain have potential applications in molecular spectroscopy, biomedicine, and remote sensing. Laser systems with CdSe crystal have obvious advantage – much broader tuning range [1-3]. In the difference-mixing of the output of parametric oscillator in CdSe to obtain the phase matched 9.4-24.3 µm tuning range . CdSe crystal has its band edge in the near infrared and shows transmission far into the infrared. 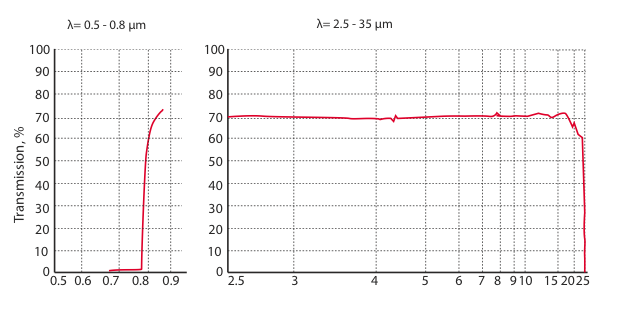 The long wavelength limit determined by the onset of lattice absorption 1.5 cm-1 @ 24.3µm. There is also a narrow impurity absorption centered at 18.5um which varies from one crystal to another. As a nonlinear optical material, CdSe crystal was explored for OPG, OPO and DFG in 1970’s [4,5]. First of all, picoseconds pulses tunable from 10 to 20 µm were produced . Furthermore, CdSe was also used to achieve megawatt peak power in the range of 8-13 and 7-12 µm, based on OPG and OPO respectively [7,8]. Where λ is in microns.